He's springy, he's wiggly, he's sweet, he's charming, he's cuddly. When he gets excited his ears get really pink. This is Peter Medley. All of these qualities are endearing, but what I like best about Peter is that he's very vocal. Any question you pose to the boy will be answered. He doesn't respond with a meow, It's kind of a long, squeaky cry. I don't think he's crying though. It doesn't seem like there's something he needs, it just seems like his regular speaking voice just happens to be high and squeaky. So, naturally I want to call him Squeaky Pete. But he prefers Peter, and I will respect that. Peter Medley, you had me at Hello. Seriously? His ears get pink when he gets excited? That is too much! You must get us "before" and "after" pics. A kitten that blushes ... now I've seen it all. This is so sweet and I am so tired (in a good way from working very hard outside), that it made me tear up a little. Maybe his squeak will mature as he gets older. Apparently, this little guy can hear. Awesome! Oh, for heaven's sake...how much more cuteness can we handle? I agree that we need before/after shots of those ears. What a cutie! I want to nom on those ears. Oh, and can we get video of him talking? My ears, toepads and nose turn super-pink when I am excited and when I am warm and sleepy. When I am just chillin', they are all very pale. Mommy loves it and wants to play with my toes. Geesh, I hate for my toes to be played with. Oh the little pink nose! My cat also has a high and squeaky voice; that is why her name is Squeaker. Oh Peter..you are a sweetie! 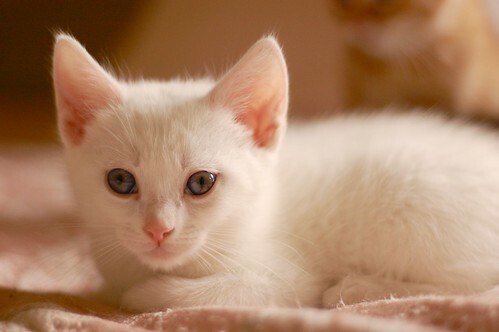 I had an all white cat when I was growing up. His name was Snowball (very imaginative for a 5 year old !). Peter..you just keep right on talking, they will give you whatever you want or whatever they think you want..so say it loud and proud !!! My current kitty Kasey has alot of white on him with a few splotches of black/brown tabby markings here and there. When he gets excited his nose and paw pads turn very pink as well! When he is resting his nose is very pale in colour. I agree, an after picture of his little pink ears would be most adorable! Peter, honey, squeak away! :) You'll have any human wrapped around your little toes in no time! Just saw the whole family on CO :) Yaaay Medleys! Hello there, little Peter! So pleased to meet you! And congrats to you and your siblings for becoming Cute Overload superstars! P.S. My Lucy's bubblegum-pink nose does that nearly-white pale to super-pink thing too! It's Peter Cottontail, right in time for Easter! A perfect name, I love it! His ears are extra-cute, they are probably also delicious. Pleased to meet you sweet boy! I love, love, LOVE talkative kitties! My current owner, Emily, a torty, is extremely talkative, ALWAYS responds when spoken to, and has a very distinctive voice, too -- although in her case it comes across as a drill sergeant giving orders. Needless to say, we obey! But little ears blushing pink? Oh, my goodness, could the cuteness get any cuter? Every single new batch of Itty Bitties, you realize, tops the last bunch, Laurie. What do you do, put in a special order with the Humane Society so you'll get only the ones that will drive us crazy with their adorableness??? Hi Peter! I love talkative kitties =D My Lucy is super chatty, and as she is a calico, she is mostly white. Her nose alternates between rosy pink and pale pink. Oh my, those squeaky voices just kill me! Melly has one, and oh my heavens, is it ever adorable. Aw, Peter, my kitty Groucho has a squeaky voice like you. He sounds like a creaky door. He's almost eleven and his voice only just started getting not-squeaky sometimes. In a litter this size, a guy's got to speak up for what he needs. You just keep right on talking, Peter. You've got a huge audience waiting to hear what you have to say!